In this paper, we empirically test the effects of the EU’s ‘cohesion policy’ on the performance of 273,500 European manufacturing firms after combining regional policy data at NUTS 2 level with firm-level data. In a framework of heterogeneous firms and different absorptive capacity of regions, we show that the financing of ‘cohesion policy’ by the European Regional Development Fund (ERDF) aimed at direct investments in R&D correlates with an improvement of firms’ productivity in a region. Conversely, funding aimed at overall Business Support correlates with negative productivity growth rates. In both cases, we registered an asymmetric impact along the firms’ productivity distribution, where a stronger impact can be detected in the first quartile, i.e. less efficient firms in a region. 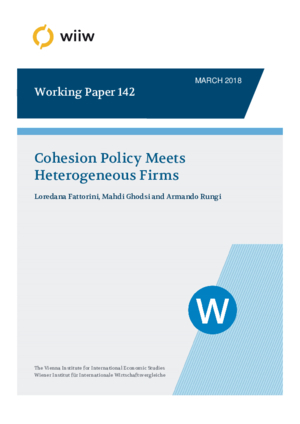 We finally argue that considering the heterogeneity of firms allows a better assessment of the impact of ‘cohesion policy’ measures.